I rack up a serious number of miles commuting on the bike, and the search for the perfect tyre choice is an ongoing pursuit. Cyclocross tyres offer that extra grip and off-road adventure capabilities; but they are slow on tarmac. Narrow road tyres are more likely to puncture (especially with a pannier load), and they are less likely to grip in challenging winter conditions. With the tubeless Roll-DIAC Tyres from the Vee Tire Company though, I think I might have found the solution. 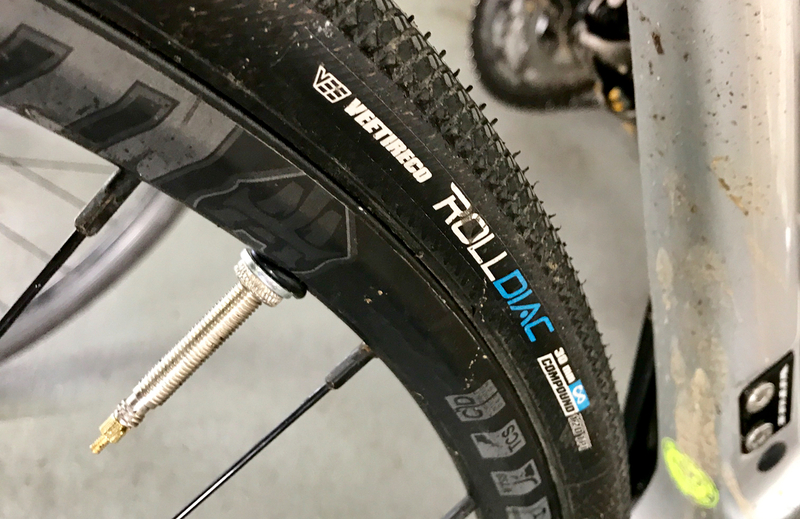 The Roll-DIAC is the same tyre as the 'Rain-Runner' in the current Vee Tire range; but it will soon be released in this new guise, featuring a larger 30c volume option (as tested here). The tyre promises exceptional grip and puncture protection, in all conditions. Easily mounted up tubeless, using the Lezyne Overdrive Pressure Pump and Effetto Mariposa Caffelatex Sealant, the tyres looked good quality from the outset. Out on the road, the tyres are impressively fast. The relatively light casing and solid centre strip helps to keep down rolling resistance. Then, lean the bike over into the corners, and the tyres' shoulders grip road or light trail surfaces with reassuring confidence, even in the wet. After 1,000 test kilometres so far, I am yet to puncture. The tubeless set-up eliminates the chance of pinch-flats, whilst I have noted the sealant has twice sealed around protruding objects. Love tubeless. Fast, grippy and puncture proof; three attributes that are always sought-after in bike tyres. These Roll-DIAC tyres from Vee Tire seem to be going the distance.